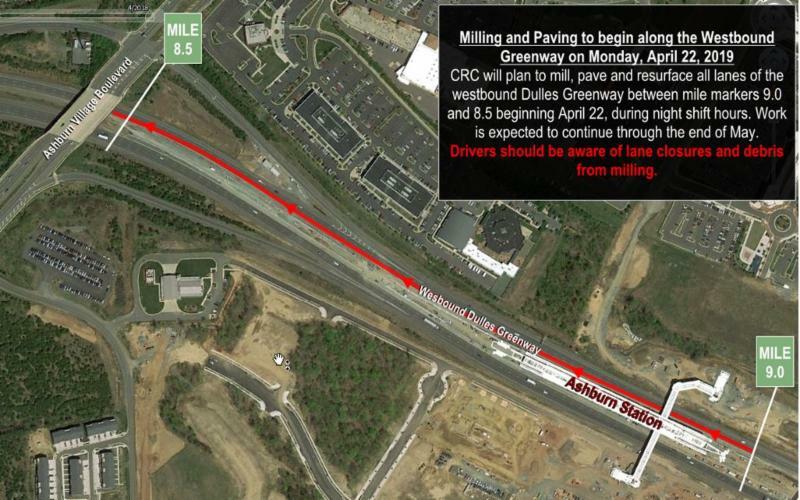 On or about Monday, April 22, CRC will begin milling along the westbound Greenway. This work will involve alternating double left and right lane closures from mile marker 9.0 at the east end of Ashburn Station through mile maker 8.5 at the Ashburn Village Boulevard overpass. The work will include milling existing pavement, paving variable depth sections and resurfacing all lanes. All work will take place overnight, from 8 p.m. to 6 a.m. It is expected that the roadwork will continue through the end of May. All traffic should be aware of lane closures and debris from the milling process along the span of work. See details below.